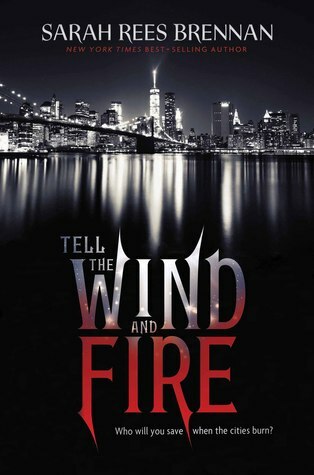 On April 5th, Sarah Rees Brennan’s new book, Tell the Wind and Fire, will be released. Thanks to NetGalley, I was able to read the book a little early, and I bring you my thoughts on this gripping fantasy today. I began reading Tell the Wind and Fire in early March, and I have to admit that it took me quite some time to really get invested in the story. It wasn’t clear in the beginning what kind of world I was reading about. It took a while for me to figure out just what was going on in this futuristic, magic-infused version of New York. Truth be told, I’m still trying to work things out. The story did pick up, though, and the more I read, the more intrigued I was…and the more I saw our world reflected in the pages of this book. The world is divided. Those who live in the Light enjoy wealth, luxury, and freedom. Those in the Dark are poor, hungry, and oppressed. Lucie Manette, born in the Dark, is part of both worlds, and she skirts a fine line between wanting to stay safe and knowing that things should be changed. Lucie is a Light Magician. As such, she practices what is considered the most pure form of magic. She’s used her magic to save her father and earn a place in Light New York. She has a seemingly perfect boyfriend, Ethan, son of the most powerful family in the city, and, though some things weigh on her, life is going relatively well for Lucie. A disturbing encounter on a train brings both Lucie and Ethan face-to-face with a secret that could tear both of their worlds apart. It is here that they meet Carwyn, a young man created with the Darkest of magic. He saves Ethan from a horrible fate…by revealing that he is Ethan’s doppelganger, a Dark Magician who could destroy Ethan and his entire family. Carwyn’s sudden appearance begins a series of events that force both Lucie and Ethan to confront what’s really going on in the city…and what they must do to change things. But their action–or lack thereof–may not be enough to control the storm that is coming. Those in the Dark are determined to wage war, and they see Lucie as the face of their revolution. They’re determined to beat back the Light…at any cost. What is Lucie to do? How can she possibly take on one more burden when she already feels overloaded by everything she’s done and the many secrets she’s keeping? Can she trust Carwyn to help her save Ethan–and many others–from a terrible fate? What is her connection to this Dark revolution, and can she use that connection to her advantage? The Light and the Dark are at war in New York City, and Lucie must decide what she’s willing to do–and who she’s willing to sacrifice–to save those she loves. What will she ultimately decide? And how will that shape Lucie in the fight to come? Discover the truth for yourself when you read Tell the Wind and Fire by Sarah Rees Brennan. According to the author’s note at the end of the book, Tell the Wind and Fire is a loose retelling of A Tale of Two Cities by Charles Dickens. I wish I had known that going in. I’m not a huge Dickens fan, but I may have read A Tale of Two Cities before starting this book if I had known of that connection. (I loathed Dickens in high school. I haven’t revisited his books as an adult. It may be time to change that. Maybe I’ll enjoy his work more now.) As it is, reading both books could lead to some interesting discussions and comparisons. Tell the Wind and Fire definitely illuminates the differences between the haves and have-nots in any society. Unless you’re living under a rock, you know that this is something our society deals with daily. The “haves” keep getting more, can buy their way out of nearly anything, and enjoy a life of privilege. The “have-nots” are persecuted, blamed for their circumstances, feared, and oftentimes barely surviving. What’s more, those in power frequently do whatever they can to keep the have-nots at the bottom of the food chain, enacting laws and erecting walls that divide the world more than ever. Am I talking about the book or the world today? Exactly. I would recommend Tell the Wind and Fire to YA and adult readers. It is extremely violent at times and deals with a politically turbulent society. Older readers, in my opinion, will appreciate the horrors and complexities in this book more than middle grade readers will. If you’d like to learn more about Tell the Wind and Fire or other books by Sarah Rees Brennan, you can connect with the author on her website, Tumblr, and Twitter. You may also want to take a look at the book trailer below. It gives a bit more information about Tell the Wind and Fire and may explain things a bit better than I did. This entry was posted in books and tagged fantasy, love, magic, oppression, thriller, war.